Celebrate Alice in Wonderland’s 150th anniversary with a tea party fit for a king, queen or indeed a Mad Hatter! 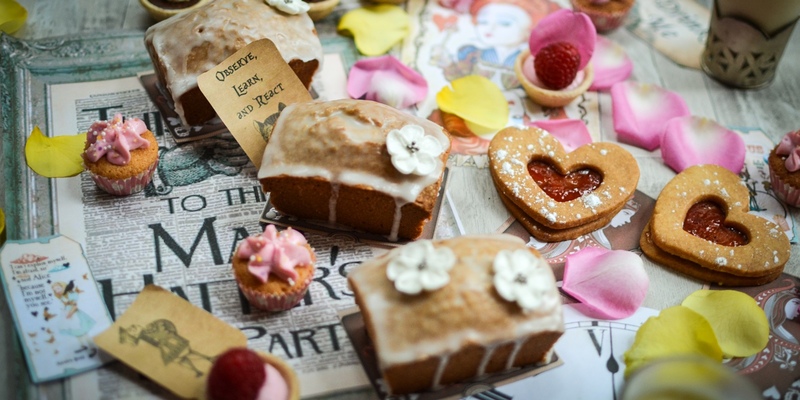 With Cheshire cat quiches and rose cupcakes, fish footman fancies and Queen of heart biscuits, all you need is the perfect cup of tea. July 2015 marks the 150th anniversary of the publishing of the literary classic, Alice in Wonderland, or by its full title, Alice’s Adventures in Wonderland. In 1865, Charles Lutwidge Dodgson, better known as Lewis Carroll, went on a boat trip in Oxfordshire with family friends, and told a young Alice Liddell the story of a girl who went in search of adventure. From this innocuous beginning, one of the world’s greatest children’s novels was born. The original story was quite different to the one we know and love today, as it took two boat trips for Dodgson to flesh out the full tale. On the second trip he added some of the most famous scenes including that of the Cheshire Cat and the Mad Hatter’s tea party - the latter of which has turned into one of the most iconic and symbolic images from the whole story. The Alice in the novel ‘always took a great interest in questions of eating and drinking’, with the size-altering mushrooms and ‘eat me - drink me’ potions being prime examples of her unquestioning appetite. Alice is invited to join the Mad Hatter’s tea party with the Hatter himself, the March Hare and the sleepy Dormouse all at the table. This most famous food scene has inspired many imitation tea parties since, but in fact the book itself only refers to there being tea and bread and butter present. Not the towering piles of cakes and dainties, sandwiches and scones that we all conjure up in our minds. In terms of cakes, we are given reference later to the Queen’s tarts. If asked what these are made of most of us would instantly assume jam, but in fact there is no reference to this at all in the novel, and indeed when asked what the tarts are made of, the cook replies mostly pepper, whilst the Dormouse suggests that they are treacle tarts. These examples go to show that the symbolic nature of the Mad Hatter’s tea party has gone beyond the book itself – it is now a way of epitomising the magical, farcical, ludicrous nature of the book in a situation that we can all relate to. By clashing it with our knowledge of a traditional afternoon tea, with both sweets and savouries on offer, we can turn it into something that conjures up Alice’s world with playing cards and flamingos, top hats and glass teapots, mushrooms and potion bottles. As long as there is good tea, served in teapots and tea cups of course, and some bread and butter, then the essence of Dodgson’s party remains.